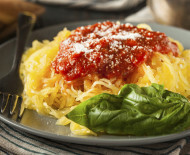 Surprise your family with this healthy, delicious dish that boasts a secret ingredient: spaghetti squash. You’ll get more nutrition than you’d believe possible from a “pasta” dish. Serve with grilled chicken and a tossed salad. Cut squash in half and scoop out seeds with a spoon. Pierce a few holes in the skin. Place squash cut-side-up in a microwave-safe dish. Add ¼ cup water to bottom of dish. Cover squash with plastic wrap pierced with a fork to allow steam to escape. Microwave for 10 to 20 minutes or until skin easily gives. Using a fork, scrape out insides of squash and pile onto a plate like pasta. Warm tomato sauce and pour desired amount over squash; mix. Sprinkle with fat-free mozzarella cheese. Recipe provided by Children’s Hospital Pediatric Nutrition Support Team.